Mount Rushmore, Disney Land, Myrtle Beach and the Grand Canyon all have one major thing in common. You ask what do they have in common; 4 seemingly different places on opposite ends of the USA? Why, they’re perfect travel destinations to take your kids of course! The weather has warmed up and by now summer vacation for most is well underway. As a child growing up this meant it was time for a family vacation which always brings smiles to everyone involved. Right? Well, maybe I should say, that the kids are all smiling, but as a mother a vacation means days of packing and planning. And, what else is it that I hate? Oh yes, hours and hours cooped in a car as one big happy (or screaming) family! As you can imagine, this isn’t necessarily how I want my happy memories to be made. So as we hit the road this year, I will be filling my arsenal with a few car games to make the car ride a little smoother – and not one of them will involve making sure I have enough movies packed for 8 straight hours of silence and that “duh” look they tend to get while watching Cars for the 14th time in a row. Free Printables – I will be arming myself with several three-ring notebooks filled to the brim with free learning printables. 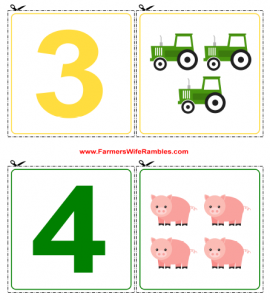 These printables will help keep my oldest on track for Kindergarten and will have my youngest well prepared for pre-school. I always laminate my printables so that they can be re-used. If you don’t have a laminator page protectors have the same effect, they just don’t keep as long. Road Sign Math – The roads are filled with road signs, and these are filled with numbers. This makes for a perfect math game without any extra materials. As you pass road signs with numbers children are expected to add the numbers together and give the correct answer. For the young ones you can start with adding the two numbers together. A speed limit sign for instance is 65. Young children will add 6+5. Older children can be expected to multiply the numbers. To make the game a little tougher you take two signs and add, subtract, multiply or divide the numbers out. Mile maker 10 + speed limit 65 = 75. I Spy – Of course I Spy has to be on my list because it can be played at any age, and any location. My youngest, Corbin, is two and already has the hang of this classic game, so it’s truly meant for any age. Not familiar with I Spy? One person picks an item that can be seen by everyone and says I Spy something…and gives one descriptive word. Each player then takes a guess. If no one guesses correctly the original “spy” gives another clue. This continues until one of the guessers gives the correct item. Car Color Game – The first road trip my husband and I took alone we played this game. As long as kids know their colors they can play along too game. Each player picks a color of car and, as you pass cars on the road, each player gets one point for their color. The winner in our car growing up was 50, but with my younger guys we play to 10. Then we start over. We have a 30 mile just to the grocery store and we play this game a lot on that drive, which just goes to show that it’s not only meant for long drives. 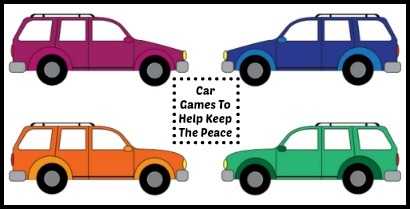 This summer as you hit the road to make memories with your family what games will you be playing in the car? How do you make the time pass without all the fighting? What were your favorite car games growing up? Great Travel Post! Thanks for your car games, I was familiar with license and color ones…this keeps them so much more engaged than plopping a video game in front of them.